Total Traffic Annihilation is article marketing software by Steven Johnson. It consists of a set of training videos to teach you about using article marketing to increase the traffic to your website and software to automate the process of distributing your articles. Johnson claims that he made more than $558,000 dollars using this software. He states that his software: will drive masses of traffic to your website; will allow you to make an unlimited amount of money; doesn’t require any technical expertise; is automatic, you push a button and it does the work for you. If this Total Traffic Annihilation does everything that it claims, it would be an incredible product. But I have seen several negative comments by people who have tried it. The first complaint is that the sales letter is misleading. It promises push-button software, but all you get is a course on doing article marketing manually. To get the software you have to pay additional money each month. The second critique is that the course’s videos are not downloadable and some users have been having trouble streaming them over the internet. This sounds like a really frustrating problem, buying a course and not being able to watch it. Perhaps, this may be fixed by the time that you read this, but keep in mind that this could be an issue. In conclusion, I can’t recommend Total Traffic Annihilation, because of the over-the-top claims in the newsletter and the negative user critiques. If you are looking for a program that requires almost no effort and generates $500,000 I think that you are likely to be disappointed. But if you are just looking to learn a little about article marketing and are willing to pay a monthly fee for the software, then this may be for you. 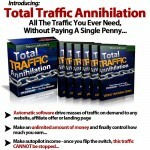 You can learn more about this program at totaltrafficannihilation.com.